It is very unusual for a third, and final, Schubert setting to be less popular than the second. It is almost always the case that we agree with the composer in his verdicts on his music: if he chose to return to a poem we can usually find a reason to explain his dissatisfaction with the earlier encounter. Comparing the settings, we can see his reasons for self-doubt (whilst allowing that he had impossibly high standards and was often too hard on himself) and we applaud the final result. There is little doubt, for example, that the final settings of the Mignon lyrics from 1826 are the glorious culmination of ongoing work on these texts for more than a decade. We would not wish to throw the earlier versions away; but the later songs seem distillations of all that had gone before, with an added element of deeper understanding and mastery. That is not the case with this song, one of the least-known of Schubert’s songs for female voice. The second version from May 1815 (D191) is enshrined in the first volume of the Peters Edition and has thus been accessible to generations of singers, and rightly so. The absence of this third setting from Peters has had a great deal to do with its low, not to say almost invisible, profile. But the second setting with its brooding intensity is a great song in a way which the third is not. It has grandeur and space, and a noble pathos. Although it has a simple strophic structure, its effect (given a fine performance) is far from simple. The piano interludes can be played stormily or as a gentle throb, depending on the words. This writing is an example of the young Schubert at his most pianistically subtle; they allow the listener to reflect on the words and feelings of each verse, and prepare for the next. What we have here, however, is something completely different, and we must conclude that it is in the nature of an experiment, an attempt by means of vigorous pianistic activity to add something new, and more febrile, to what had already been achieved in 1815. The vocal line is not dissimilar in range, stature and difficulty to D191, and the key is the same C minor. But the accompaniment is a restless cauldron of incessant demisemiquaver triplets; indeed, there is nothing else quite like them in all Schubert’s song output. The Schubert accompanist becomes used to the ‘feel’ of this composer’s piano writing, and can quickly detect the unusual; this accompaniment is clearly a ‘one-off’ where Schubert toys with the manner of the virtuoso pianists of the time. (There are a number of occasions when this writing, reminiscent of Hummel or Kalkbrenner, occurs in Schubert’s chamber or solo piano music, but it is extremely rare in the lieder.) Musical energy is provided by the unrelenting ‘blackness’ of pianistic texture – the sheer number of dragon’s-teeth notes packed in the smallest space, and with no sign of a rest, or any respite for the wrist. In comparison to this, even Schubert’s notoriously difficult moto perpetuo songs like Erlkönig are redeemed by the presence of light and space and air. A demanding song like Versunken, with its incessant semiquavers, is a delightfully woven cascade of artfully developed thematic material; but in the third version of Des Mädchens Klage we have turbulent broken-chord scrubbing around the basic harmonies. It is not that it is particularly difficult to play – the fingerwork is too automatic and predictable for that; and the pianistically engendered turbulence is effective in its way as a background for a soaring vocal line. It is just not truly Schubertian. The lack of an introduction and the almost peremptory ending also seem untypical. Where does this style come from then? In the absence of a complete modern edition of the songs of Carl Maria von Weber it has been difficult to assess the influence of that composer’s songs on Schubert – and we must remember that this was a composer whom Schubert knew personally later in his life. It seems certain that Weber’s settings of the war hero Theodor Körner would have interested Schubert (he had met the poet in Vienna, and admired him as man and artist). Weber’s Leyer und Schwert songs to Körner’s battle-inspired texts were published in Berlin in 1815. 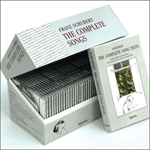 The first of the set, Gebet während der Schlacht, was also set by Schubert in 1815 with a most uncharacteristic and restless accompaniment. But it is surely the non-stop demisemiquavers of the Weber song (also in C minor) which seem to have temporarily diverted Schubert away from his true style. All that scurrying about was new and impressive, but ultimately futile: a lied can never double as a piano étude without diminishing the expressiveness of the words – Liszt learned this lesson many years later. In the greatest songs, the rests between the notes are as eloquent as the notes themselves. The first setting of this poem (D6) had been extreme and experimental in another way. The fourteen-year-old’s inexperience in writing vocal music is as evident from the very start (the unreasonable tessitura is almost comically difficult) as is his inherent dramatic flair and feeling for words. There is much that is interesting in this youthful indiscretion, but it is hardly a surprise that Schubert put the poem to one side and returned to it in 1815 to set it a second time. The third version from 1816, strophic in the same manner, seems to be an attempt to combine the grand and magisterial vocal line of D191 with something of the wildness that characterized the through-composed (and very episodic) D6. Of course, there are marvellous touches like the voice’s rise in wailing semitones on ‘sie seufzt hinaus in die finstere Nacht’ (an effect which recalls the ghostly ‘Ade!’ of the dancing spirits in the choral version of Der Geistertanz), but even the vocal line of D389 seems less inspired than D191. None of the settings really comes to terms with the central problem of this text which is that the maiden’s own voice is heard only in the second and fourth strophes (which are printed in inverted commas). The first strophe is scene-setting introduction, and the third strophe reveals the Virgin Mary (‘Ich, die Himmlische’) who speaks comfortingly to the desperately unhappy girl. In D6 the teenage composer seems not to understand what is happening in the poem. 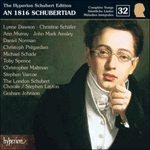 And in both D191 and D389 the more mature young master leaves this differentiation in characterization to the performers, so posing them an almost impossible task: in this mini-drama it is all but impossible adequately to vary the mood between earthly plaint and heavenly consolation without more help from Schubert himself. If ever a text called for one of his magical changes from minor to major – a modified strophic song – this is it. On the other hand there is undoubtedly something darkly hypnotic and compulsive about the music in the rigidly strophic form which Schubert has chosen. We are left with the impression that the composer has imagined the Madonna speaking through the girl herself, rather than addressing her in a heavenly visitation. Das Auge vom Weinen getrübet. Ich, die Himmlische, will’s nicht versagen. Es wecke die Klage die Toten nicht auf! her eyes dimmed with weeping. and no longer yields to my desire. Holy one, call back your child. when the joys of sweet love have vanished? I, the heavenly maiden, shall not deny it. let my lament not awaken the dead!